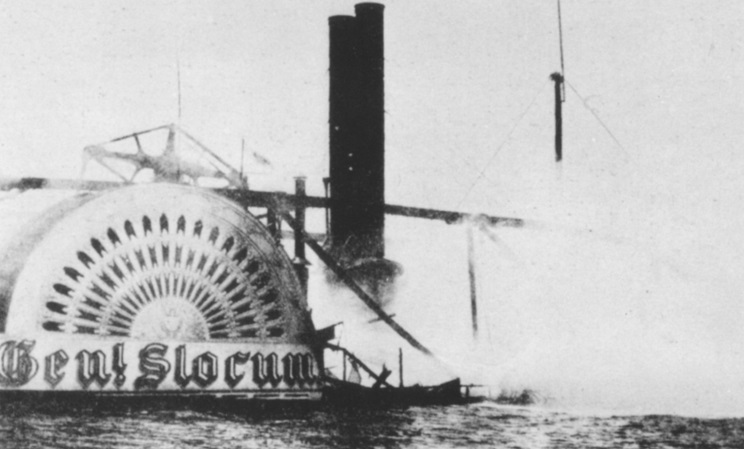 June 15, 1904: The sidewheel steamer General Slocum burned on New York's East River. The steamer was taking some 1,400 (mostly German-Americans) to Locust Point for a picnic sponsored by St. Mark's German Lutheran Church. The ship departed around 9am from the third street pier and was proceeding up the river when a fire broke out. It is not clear how or exactly where the fire started, but soon it was clear that it was out of control. The fire protection equipment was inadequate or inoperable all together. The captain, William van Schaick, decided to beach the ship on Brother Island instead of heading to Manhattan Island, which was only 1,000 feet away, this action doomed many of the passengers. Driven by the wind this allowed more time for the fire to spread. 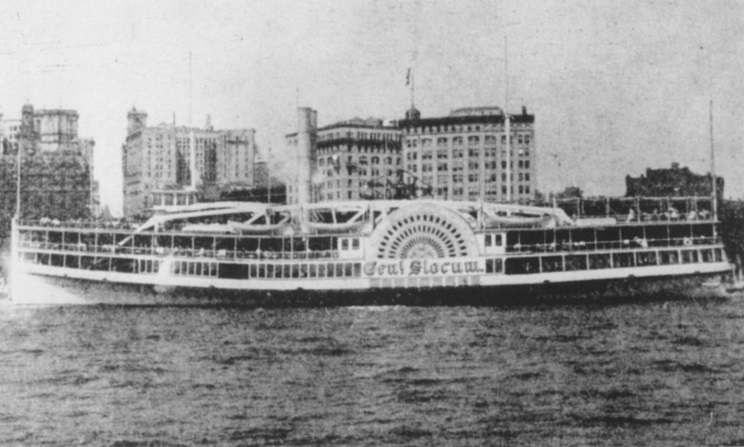 Hundreds of passengers who had gathered on the stern on the General Slocum were now trapped by the flames. The final nail in the coffin was the fact that the life preservers were so old they had rotted and were useless, some had even been filled with metal rods to bring them up to the proper weight standard. The General Slocum was grounded on Brother Island, but the stern was still in 30 feet of water. Tugs arrived and began rescuing survivors. 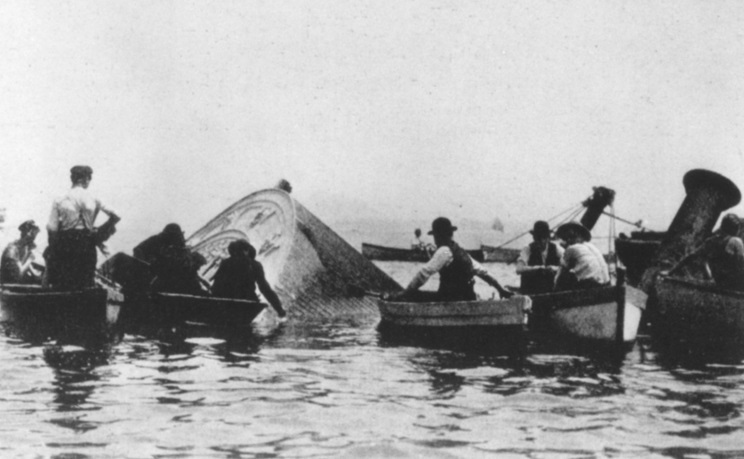 The captain and some members of the crew were later criticized for their alleged failure to help rescue passengers, however three crewmen, Everett Brandow, George Conklin and William Trembly were cited for bravery in the face of great danger. Trembly rescued several women and children and Conklin paid with his life, following this the ship burned to the water line. Four hundred and seven people were rescued from the General Slocum, but the death toll was huge, one thousand and twenty-one were killed. Making this the second worst ship disaster in U.S. history, the worst being the fire that consumed the sidewheel steamer Sultana on April 26, 1865 in which 1,547 were killed. Captain van Schaick was charged and convicted of manslaughter and failing to give his crew proper training. He was sentenced to ten years in prison, but was pardoned in 1908. The last known survivor, Adella Liebenow Wotherspoon, died in January 2004 at the age of 100. Her two sisters, two cousins and two aunts died on the General Slocum.